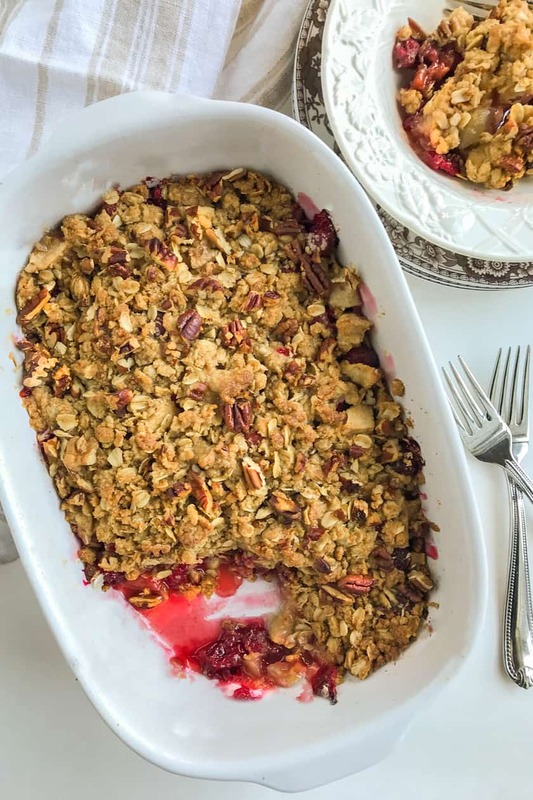 Cranberry Apple Crisp is my go-to cozy treat when the air begins to cool and the holidays are within sight. Incredibly easy to make, sweet as only baked apples can be, slightly tangy with fresh cranberries, warmly spiced with cinnamon and orange zest. Finished off with a buttery, flaky topping I can never get enough of. It’s a treat. A warming, lovely end to a brisk and busy day. A perfect side for the holidays. Or even a night by the fire. For me… it’s like a taste of the holidays with every bite. A perfect after dinner dessert — or even a decadent breakfast. No judging. It’s the holidays! 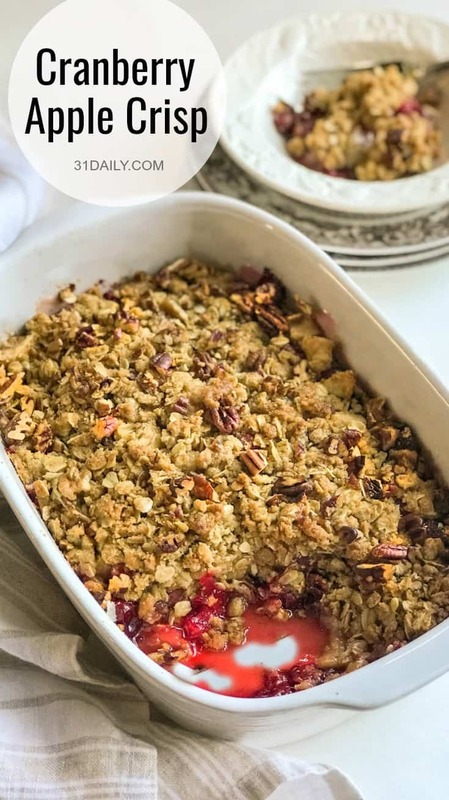 Cranberry Apple Crisp is my go-to cozy treat when the air begins to cool and the holidays are within sight. 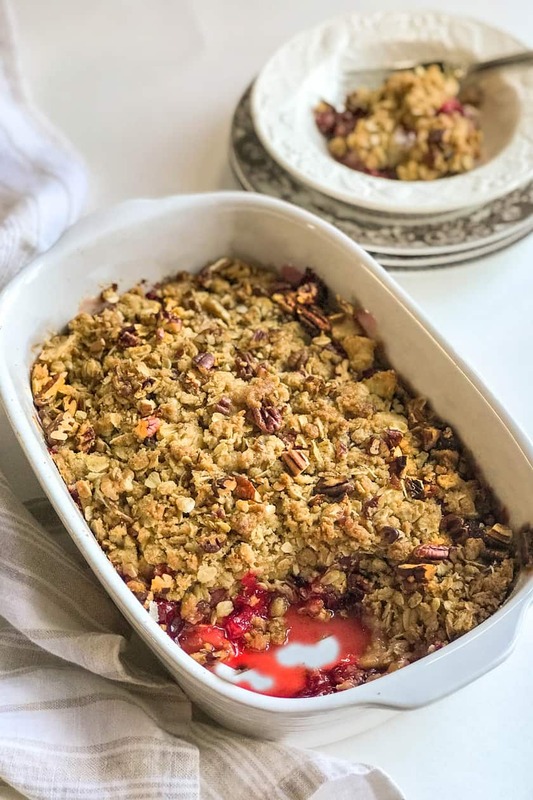 Incredibly easy to make, sweet as only baked apples can be, slightly tangy with fresh cranberries, warmly spiced with cinnamon and orange zest. Finished off with a buttery, flaky topping I can never get enough of. 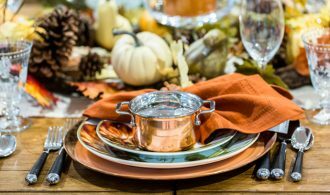 Preheat the oven to 375 degrees F and spray a baking pan (8×8, 9×9, or oblong) with nonstick cooking spray. Set aside. 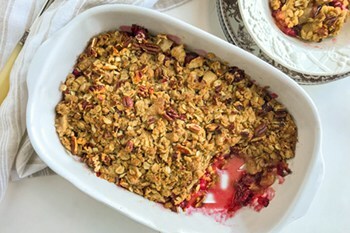 In a medium-size bowl, toss together the apples, cranberries, sugar, flour, cinnamon, and orange zest if using. 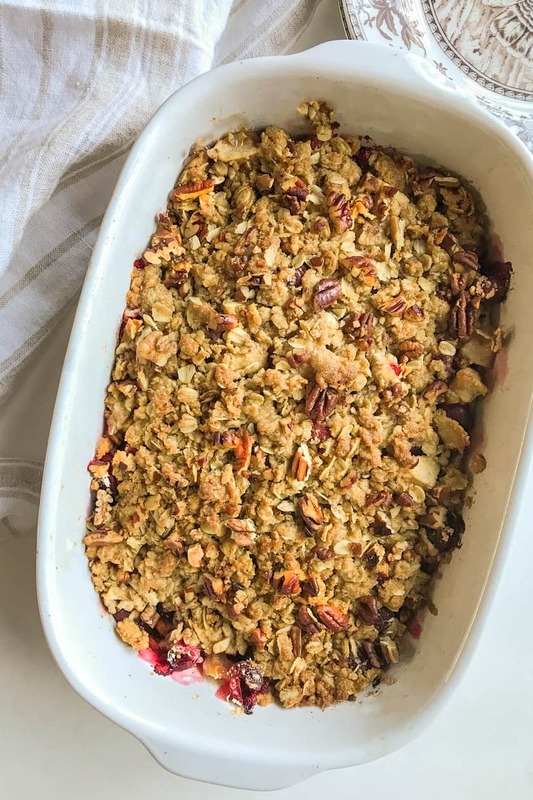 Spoon into the prepared baking pan. Into the now empty bowl, add the topping ingredients: oats, brown sugar, flour, and softened butter. 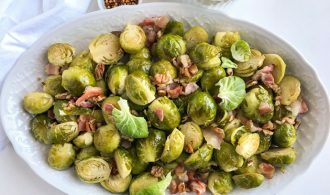 With a fork or spoon, mix together until small clumps form. Be sure there are no flour pockets. Spread the topping evenly over the apples and cranberries. Sprinkle the pecans over the topping. Bake in the preheated 375-degree oven to 30 to 40 minutes (see note), or until the apples are fork tender and the topping is golden brown. I like to see some bubbling around the edges before I pull it out of the oven. Sugar note: As you know, cranberries can be tart. I tend to like them that way and use the lesser amount of sugar (1/2 cup) with the filling. 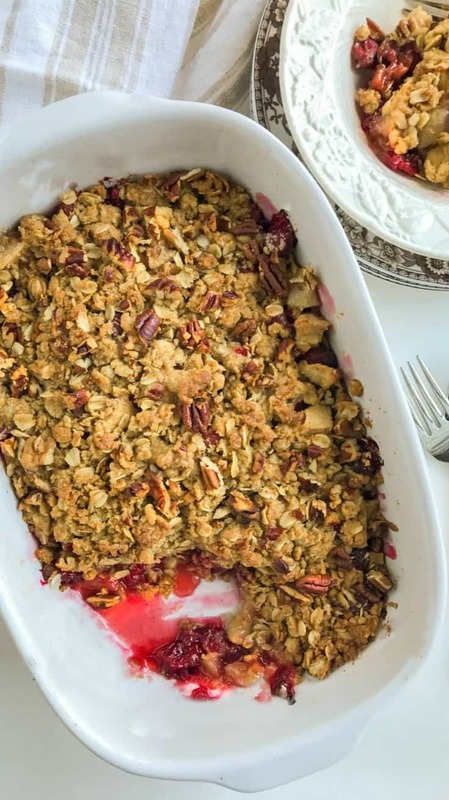 If you like a sweeter, less tart cranberry, add the additional sugar. Baking note: a larger baking pan (like the 9×9) will require less baking time than a smaller dish (like the 8×8). At about 25 minutes, I begin checking the apples with a fork to see how tender they are. The time will depend on how thick/tall the crisp is in the pan. I love to use my oval baker which gives me a baking time around 35 minutes. Yay!! We loved it too!